For osteoporosis prevention, you want the best exercise to do the job. And it wouldn't hurt if that form of exercise was relatively easy, safe and even fun. Sue Tripp of California (In September 2000) submitted this testimony to Al Carter, a major developer of the concept of rebound exercise and some top-quality equipment to go with it. "Hi, my name is M. Sue Tripp. I purchased a Rebounder in 1981 after the death of my husband. Over time, I lost interest in the unit and passed it on to someone else. Bad move. In 1985 I remarried. My new husband and I had a friend in Oregon who had been diagnosed with cancer and had chosen to follow an alternative route from radiation, chemo and drugs to take care of himself. He purchased a big trampoline and altered his eating habits and used numerous vitamin supplements and other alternative therapies. When he was first diagnosed he was given six months to live. He lived seven years under his own steam and with the help of the trampoline and alternative choices. This friend encouraged us to use a big trampoline for our own exercise program. We were already walking four miles a day and had entered a walking race when we were 57 years old and both won second place, (we were racing against much younger male and females and were given no handicaps.) We were in good shape and decided to stay that way with following his suggestion and purchased a big trampoline. We worked out with our own program, had a physical sports professional view a video we made and proceeded to start developing our own video for exercise to be used by those over 55. However, our plans were changed due to various circumstances and we were unable to finish the project and ended up on a traveling trip of some eight months. On that trip we took a small rebounder because we didn't want to lose the benefits of jumping for joy and health. After that trip we were divorced (not because of the trip but because we found we were wanting to go different directions with our lives). Upshot of the divorce was that he ended up with the trampolines and I had none. Horrors! I then purchased my own which sits in my bedroom for me to jump on everyday. I have been doing this for ten years for at least 15 minutes per day and sometimes more and sometimes less. 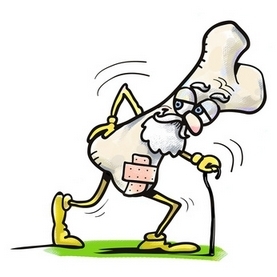 Now, the whole point of this story is that my friend, who is a Nurse Practitioner, suggested that I have a free bone density test at her office, just for information and because I am now 67 years young. After I was given the heel scan, the nurse looked at me and asked me if I take extra calcium. I said, "Not on a regular basis, only when I remember, and I do take supplements which have a small amount of calcium." She actually was so excited about my reading that she couldn't believe my age. She said, "You have the bones of a 17 year old!" The reading was done with a Sahara Clinical Bone Sonometer and measured a T-score of 2.8. Pretty amazing for someone my age. Just wanted you to have this new testimonial from one happy, unmarried, healthy lady who is looking forward to more healthy years on my rebounder. I'm sure that this test was a result of my exercise on a trampoline, my eating habits and good mental health. That is a great testimony and a good example of what rebounding can do to strengthen your bones and help with osteoporosis prevention. Take the right steps today and you can easily avoid the pain and complications of osteoporosis. Prevention is key and the informaion on these pages can help you achieve natural pain relief.